These Vegan Cookie Dough Bars are made with real ingredients and are naturally sweetened! If I know one thing about you it’s that you are in love with cookie dough. The Vegan Cookie Dough for One that I shared with you a few weeks ago quickly skyrocketed to become one of my most popular posts ever. Apparently the world has been waiting for some safe, perfectly portioned cookie dough to get in their faces. I wanted to take things one step further and create more of a classic dessert or party snack. These vegan cookie dough bars will last for a week well wrapped in the refrigerator, so even if you’re not sharing you’ll have your sweet tooth covered all week. These vegan cookie dough bars are just sweet enough to satisfy your cravings and healthy enough to be a substantial snack that will give you lasting energy. You know how sometimes you eat junk food and it just leaves you wanting more? These bars are legitimately satisfying. While I found myself wanting to eat more because they were delicious, it wasn’t in that scientific brain-tongue-craving kind of way. Aaand now I’ve told you that you won’t want to eat a bajillion of these, which simultaneously makes me a liar and the worst food blogger ever. Anywaaays… This treat is vegan! The cookie dough is basically the aforementioned cookie dough for one, sweetened with maple syrup (no, it does not taste like pancakes), and the bottom is basically a larabar, sweetened with dates. 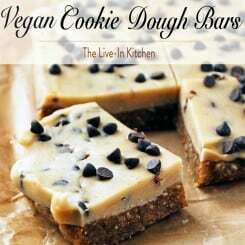 These vegan cookie dough bars are perfect as a little after dinner bite and would be a lovely addition to a healthier party spread. What other kinds of desserts would you like to see vegan-ized or health-ified? Let me know in the comments below! These bars are sweet without being over powering. They are a healthier, all natural way to satisfy that sweet tooth as well as your hunger. Line a 7" x 5 1/2" pan with parchment paper. Set aside. Place almonds in the bowl of a food processor and process until coarse but not powdery. Add the dates, a pinch of salt, and 1/4 teaspoon of the vanilla and process until a dough ball forms. If the dough seems too crumbly, add a few drops of water until you reach the desired consistency. Be careful because too much water will make the dough extremely sticky. Press the dough into an even layer in the prepared pan and set aside. In a medium sized bowl, combine the coconut oil, maple syrup, and 3/4 teaspoon vanilla with a fork until thick and well combined. Add the flour and mix until smooth and shiny. Mix in 1 tablespoon of the mini chocolate chips. Pour the cookie dough over the almond mixture in the pan and smooth the top. Sprinkle with an additional tablespoon of chocolate chips, if desired, and use your hand to gently press them into the dough so they'll stick. Refrigerate until set, about 30 minutes. Use the parchment to lift the bars from the pan and cut into bars or bite sized portions. At this point you can transfer them to an airtight container and refrigerate until ready to serve, up to one week. I left the parchment in a pyrex baking dish with a tight fitting lid to keep things from sticking while still being airtight. These are amazing! I can’t wait to try them! 😀 I have a feeling I’m going to be obsessed. These look incredible, love everything about them. I have friends with some food allergies, and this is an ideal recipe for them. Thanks, Lindsay! Could pecans be substituted for the almonds? I have to work around food allergies. Absolutely! I think pecans would be lovely here. The overall flavor would be a little different since pecans tend to have a more distinct taste, but if you’re used to eating them instead of almonds I don’t think it should be a problem. It depends on how big you like them, but it makes 8-16 servings. Hi Lindsay, I’m so glad we got to meet this weekend at Go Blog Social! You have a gorgeous blog and your photography is beautiful! Thank you so much! I’m glad we met as well and I can’t wait to dive in to your blog! Wow! I made these last weekend, and I have fallen head over heels in love with them! I’m in the beginning stages of my vegan journey, and I’m try to cut out as much “non-vegan” food as possible. 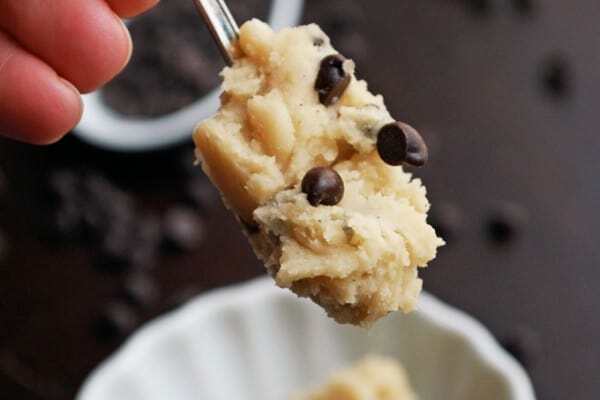 One of the things I’ve had a hard time avoiding is my all time favorite-Cookie Dough! These bars really satisfied my craving and THEY’RE VEGAN! Thank you!!! 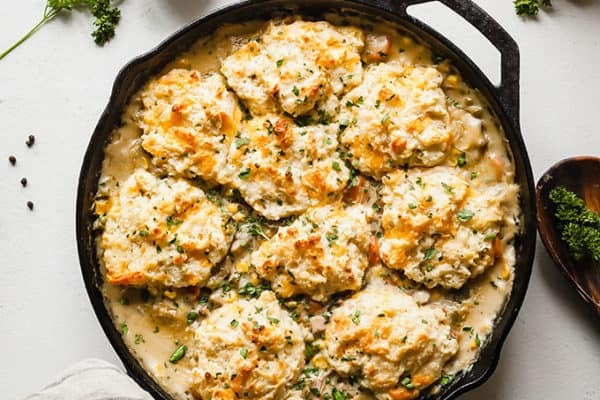 If it’s okay with you, I would like to share this recipe on my blog! Yay! I’m so glad you liked them. 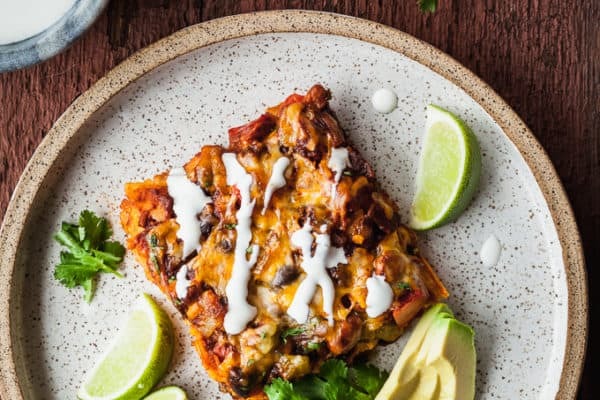 I would be happy to allow you to share the recipe on your blog, I just ask that you credit with a link to the original post and that you use your own photos. Yay! I’m glad you liked them. Thanks for the recipe, ma’am! I made them and they’re oh so tasty. I didn’t have any almonds so I used pecans. Andddd I was fresh out of whole wheat flour so I played around with the measurements and used some coconut flour. Hahah but they still turned out quite well. I put them in a muffin pan so I wouldn’t have to worry about slicing them, worked out perfectly! I’m glad you enjoyed them! What a great idea to use a muffin pan! These ‘brownies’ are fabulous! I used carob chips and whole wheat flour. I LOVE them. My daughter makes a mean non-vegan cookie dough brownie, now I will enjoy one that is just as delicious. Thanks for sharing this recipe. Thanks for a great recipe! I made my own take on yours and posted the recipe on my blog, linking back to this page. If there’s anything you’d like for me to update or add, please let me know. Could I make these gluten free? I have personally not tried it. I’ve heard from readers who have tried gluten-free flour that you may need to adjust the amount of flour you use and certain gluten-free flours will have a slightly different taste. Give it a try with whatever your favorite gluten-free flour is and let me know how it goes! I made these for a gathering recently and they were a big hit! I did cut back significantly on the maple syrup and used about 2 tsp and thought it was still plenty sweet with the dates and the chocolate chips. My four year old was so sad we didn’t have any to bring home! I’m glad everyone enjoyed it! My kids love them too! I made these last night and loved the ‘crust’ with the dates but had trouble with the flour/maple syrup/coconut oil mixture. It was much too thick and I had to spread it over the crust with a knife vs. ‘pouring it over’ as the instructions say. I also found the taste to be very floury. Am I doing something wrong? Everyone else seems to have great reviews. I’m sorry to hear you had trouble! The cookie dough mixture can be greatly affected by several things, hopefully I can help you pinpoint that. If it is very cold in your house the mixture will be thicker. Make sure you are warming and melting the coconut oil completely and try adding the flour a little at a time until you reach a consistency you’re comfortable with. You can also cut back on the flour a bit or add a touch more vanilla or maple syrup if it is too floury for your taste. I have experienced this as well when I was not measuring very closely. I hope that helps! Hello! This recpie is amazinnngg. I´ve been vegan for 4 months now and I want to try your recepie but I have one question: is it ok to use all purpose flour? I´am afraid that I will have problems with my stomach. Can I replace it with something else? Thanks a lot! I used all-purpose flour for this, so I know it will turn out great. If you need to replace it, any other type of flour should work fine with varied results in flavor and texture. Looks delicious! Have to try the vegan cookie bars this weekend! Did anyone made them with Spelt flour maybe? thoughts?